The Suffolk is a truly pure and unique breed that has been proven for over 200 years. The uniformity and hardiness of this breed maximizes the hybrid vigour of the progeny. 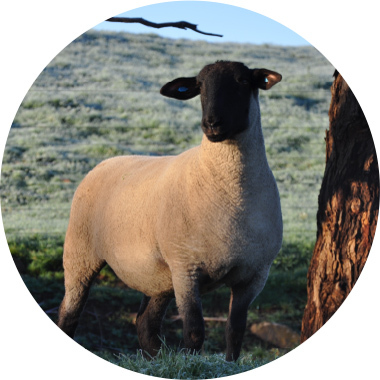 The use of the Suffolk sire is preferred on maiden ewes and makes identification of cross bred lambs easier. The Suffolk breed is the most recognised breed worldwide. It is unsurpassed in eating quality and is considered the breed for the table. The black hard feet make sure that the Suffolk are built to go the distance. The early maturing lambs increase profits for prime lamb producers. Adaptability For all environments. The breed thrives in wet conditions with its hard black feet, having immunity to foot diseases. Suffolks are also outstanding in the dry areas where the high fertility rams work well even in hot summer conditions. Large framed sheep with strikingly attractive black head and legs. Long thick set body and smooth shoudlers. Back and loin, long & level, well covered with meat. Ribs deep and well sprung. Hindquarters and twist, wide deep and meaty. Tail well set up. Legs straight. Hocks weel sprung, standing high on strong feet. 1600's Norfolks were crossed with Southdowns and originally known as Southdown Norfolks or Blackfaces. 1774 An agricultural writer said "It has been observed these (sheep) ought to be called the Suffolk breed, the mutton for the table has no superior in texture or grain, flavour, quantity and colour of gravy." 1810 Accepted as purebreds. The name Suffolk was used for the first time. 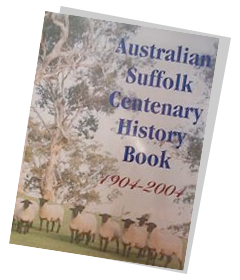 early 1800's Historical records show that the first Suffolks were bought to Australia by Rev. Samuel Marsden. 1887 First Flock Book published - 46 flocks were registered, 32 of these in the County of Suffolk. 140 registered flocks by 1900. 1903 Suffolks imported from England by Albury sheep breeder Mr GR Jackson - generally recognised as the 'first' Suffolks to come to Australia. 1959 Classes introduced at the Suffolk Agricultural Association Show. 1984 593 Studs registered in the 1984 Flock Book. Around 25,000 stud ewes mated.